The death of an otter caught in a snare in Cornwall is being investigated by wildlife experts. 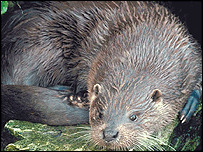 The young male otter was found near Looe over the Bank Holiday weekend. A wire snare was wrapped around its neck. The wire had cut into its flesh and muscle right down to its spine and its skull was crushed. Animal welfare experts say the otter would have struggled for hours and the vet who performed the post mortem says it would have been a terrible death. Vic Simpson said: "Over the past 16 years I've done something like 500 post mortem examinations on otters and these are the worst injuries I've ever seen"
It is not yet clear if the snare had been legally set for a fox, or illegally set to catch the otter. The otter population in Devon and Cornwall has increased in recent years. They are very efficient hunters and sometimes take fish from private ponds and commercial lakes. But the Environment Agency says killing otters is illegal and culprits will be prosecuted and risk being fined. There has been a series of attacks on otters in the county in recent months. One was found dead after it was thrown off a cliff at Perranporth, one was shot near Hayle and an otter pelt was found hanging on a fence near Looe. In the most recent attack last month, an otter had its tail and a leg hacked off. Cornwall Wildlife Trust believe the leg and tail may have been taken as trophies and says the recent attacks are bizarre and unacceptable.